People who study ecological design and live sustainably off the grid understand the importance of thermal mass for keeping places cool in the summer and warm in the winter. This energy efficient thinking shouldn't be limited to off-the-grid living as sustainable solutions continue to find their way into urban landscapes as saving energy means saving money. As water issues continue to plague many parts of the planet, the notion of rainwater harvesting becomes more logical. Walls 2.0 has a great idea that combines rainwater harvesting with an energy efficient building technique that allows you to store rainwater in your walls. This idea was born in Tucson, Arizona where water and hot summers are an issue. Randy Young, creator of Walls 2.0, says that this concept will work well in hot or cold climates. Large bodies of water under ground called aquifers are often compared to a savings account. When cities take more out of the aquifer than is replenished they will go bankrupt. Much of the water in aquifers is leftover from glacial melt. We are seeing the water crisis hit major cities across the South and in the West. Los Angeles as an example has been draining glacial lakes in the northern part of the state and transporting the water through aqueducts that stretch hundreds of miles. Draining aquifers or glacial lakes is a bad idea. Gathering water closer to the source is more economical and sustainable, that's why rainwater catchment is a no-brainer. A one-inch rain will collect 600 gallons from a 1,000 square foot roof. Apply this thinking to more than just residential homes, consider warehouses, office buildings and large sports arenas. To use the banking analogy with water again, we are spending all our savings and ignoring dollars that literally fall from the sky. Actually comparing money to water is ridiculous because money means nothing without water since water is life. So now that we are realizing the importance of collecting rainwater, where can we store it? Many tanks require internal coatings that must be reapplied regularly. Plastic water tanks in dry, sunny places only last about ten years. Steel tanks will rust in 30 to 50 years. These containers will become large waste in a landfill before long. 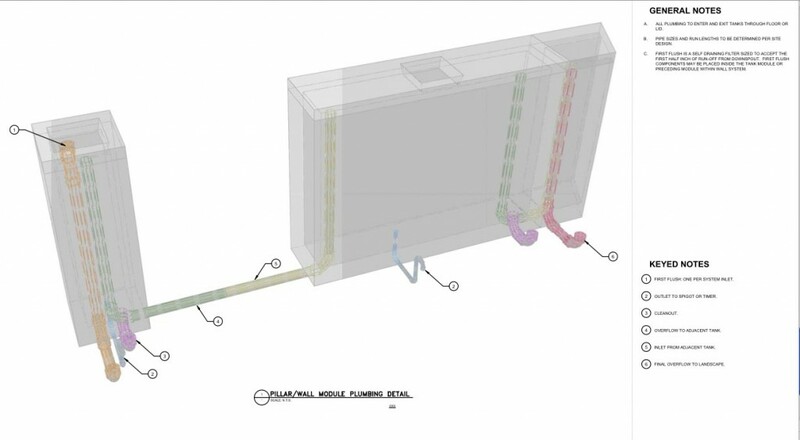 That's why Randy Young and his team have come up with an effective way to store water in the walls so that you can also make use of it's thermal qualities for passive heating and cooling. These cement walls use Krystol Internal Membrane that is added to the liquid concrete. During the curing process K.I.M. builds crystals in the pores of the concrete making it fully dense and water proof and allowing it to last 3-4 times conventional storage tanks. Thermal mass is critical in passive solar designs. Concrete, adobe or rammed earth are often used to create this thermal mass, but water has three times the thermal mass of traditional building materials. This means concrete walls that are filled with water have significantly better thermal properties. For anyone who has spent time putting traditional insulation in their walls and been itchy from fiberglass splinters will rejoice at this new innovation. People who think in terms of sustainability are also humanitarians who see the interconnectedness between human communities and the natural environment. These prototypes will be going in at Watershed Management Groups headquarters in Tucson, Arizona. Watershed Management Group (WMG) develops community-based solutions to ensure the long-term prosperity of people and health of the environment. They teach water harvesting workshops, offer certifications, and affect community water and building policies and regulations locally, and if you're not in Tucson you might want to find an organization like this in your area or start your own. The notion of biomimicry is a great way to design our world in ways that benefit local ecosystems instead of depleting them. Walls 2.0 is one such example of ingenuity, function and form that make simple solutions which are good for people, planet and economy. Check out this fun and informative video below to consider ways that you might reduce your own ecological footprint. Reducing water and energy consumption is simple if we put our minds to it, but conservation is only one important part of the sustainability equation. How many other great inventions are out there just waiting to be discovered? Keep your eyes out and let me know what you find! I will continue to write solutions-oriented blogs and share what I find as well.